Tori Gerbig is the co-founder and CEO of Pink Lily, one of the fastest growing online fashion retailers in America. 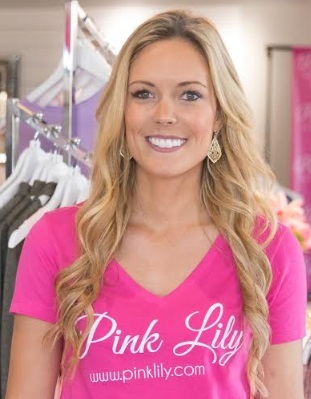 Pink Lily ships more than 1,000 orders each day and has delivered more than 1.5 million products to customers since the shop opened to customers in 2014. Professionally, I am a great goal setter and am constantly pushing myself to reach new milestones. On a personal level, I enjoy being the person to coordinate meetups and finding reasons to bring friends and family together! My work ethic. My parents taught me at an early age that hard work and work ethic are the only things that put everybody on a level field in the workforce. We are all capable of hard work no matter how much money we have, what school we went to, or where we grew up. This mindset has made me the person I am. My perfect vision of the future is a world where my daughter and son are thriving, and so is our family business. I envision Pink Lily becoming a trusted brand and household name around the world. A business that sets the standard for giving back and paying it forward. Our business success has remained strong and beyond financial achievements our contributions personally and philanthropically have continued to build strong relationships with customers and communities. I feel so lucky to have two thriving and healthy children – they are my greatest personal success. I’m also very proud of the incredible growth that Chris, my husband and co-founder, and I have brought to Pink Lily. We recently surpassed a major milestone of $50 million in sales in 4 years. The kind of rapid growth we have seen at Pink Lily can be difficult. It comes with increased responsibilities, stress, employee relations and the continual need to stay up with the latest trends. Learning to manage this type of stress while also balancing my personal commitments and role as a mother is something I’m always working on! Don’t get too comfortable in your success. Always make new goals once you reach your first one. I admire Lauren Conrad and the successful clothing company she has created. The beach! This is where you can find me if I’m not busy working or at home. Evenings spent toasting with friends, afternoons with my family, trips to the beach and weekdays dedicated to growing our business!